Safety-related concrete has been poured for the basemat of the second AP1000 unit at the Vogtle plant in Georgia. The milestone means that four AP1000s are now officially under construction in the USA. The basemat provides a foundation for the containment and auxiliary buildings that are within the unit's nuclear island. Measuring 1.8 metres thick, the basemat required some 5350 cubic metres of concrete to cover an area about 76 metres by 49 metres. The concrete-pouring process took 40 hours and 46 minutes to complete. Georgia Power noted, "The efficiency of this placement matches the best time achieved worldwide for this AP1000 activity." Once the concrete basemat has hardened, the containment vessel bottom head and its supporting cradle will be placed on the nuclear island. The concrete foundation of unit 4's turbine building has already been completed and the installation of wall sections has started. Buzz Miller, executive vice president of nuclear development for Georgia Power and Southern Nuclear, commented: "As we reach the midpoint in the historic construction of units 3 and 4, the visible progress at the site is setting the stage for a secure energy future for Georgia and the rest of the country." Georgia Power noted that, once completed, the Vogtle plant will be the only four-unit nuclear power plant in the USA. Two AP1000 units are also under construction at the VC Summer plant in South Carolina, operated by South Carolina Electric & Gas (SCE&G), a subsidiary of Scana Corporation, and co-owned by SCE&G and Santee Cooper. 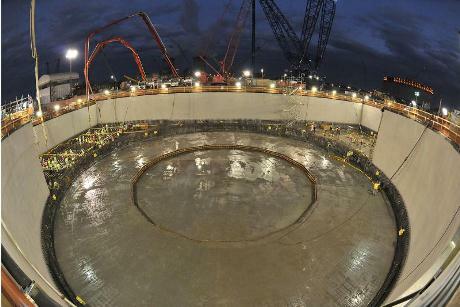 First concrete at Summer 2 came in mid-March, just days before the same milestone at Vogtle 3. First concrete at Summer unit 3 was poured in early November. Westinghouse senior vice president for nuclear power plants Jeff Benjamin said, "This has been an exciting month for Westinghouse; our consortium partner, Chicago Bridge & Iron (CB&I); and our customers, as we successfully completed the basemat nuclear concrete placement for the second AP1000 units at both the VC Summer and Vogtle nuclear sites." He added, "This milestone has now been achieved at all eight of the AP1000 units we are delivering to our customers globally." Four AP1000 reactors are also being built in China, at Sanmen and Haiyang for China National Nuclear Corporation and China Power Investment Corp respectively. Sanmen unit 1 is expected to be the first AP1000 to begin operating. The unit is expected to begin generating electricity next year. All four Chinese AP1000s are scheduled to be in operation by 2016.